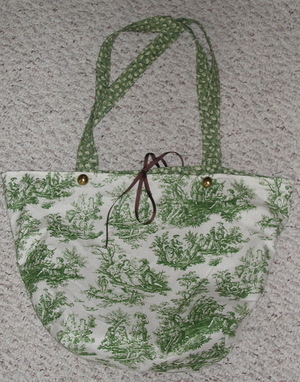 here's another bag i made as a gift for a friend. i originally had a blue toile picked out for her but one of the boys touched the fabric with chocolate fingers and it didn't come out! you can't have chocolate stains on a birthday present! oh well. i had to rethink the whole thing - but i got to use some of my buttons for this - first time! i wish i would have used some interfacing in this one to make it a little stiffer - otherwise i think it turned out pretty cute. i'm liking making bags - i can do them in one sitting (if the kids are asleep) so i feel that sense of actually getting something finished - and i love playing with fabric combinations, too. wish i had time to make some to try and sell, but i guess i'm lucky to have time to make some at all. also, birthday presents have 'deadlines' - and i always work better with a deadline! oh, and see my pretty new button on my sidebar? got my swap partner's info and am looking forward to swapping buttons with someone in australia - isn't that cool?